Students from The Improvisational Group of Lawrence University (IGLU) performed their own soundtrack to a silent film on Halloween. 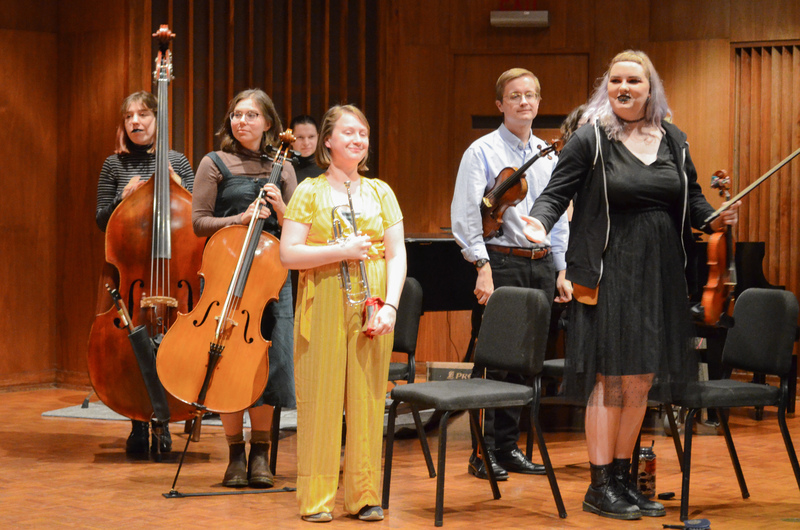 The Improvisational Group of Lawrence University (IGLU) hosted their first performance of the year on Halloween, so naturally it was a spooky affair. The event was centered on the German silent film “The Cabinet of Dr. Caligari” and the ensemble’s improvised score. The story is told in six acts and centers on a young man named Francis, who mourns and investigates the murder of his friend, Alan. Francis blames a doctor the two met at a fair and the “somnambulist” who predicted Alan’s death. The dialogue and other important textual details were conveyed with text screens — a jagged, thematic font expressed the German, which the subtitles translated to English. The scenes almost always faded in and out, utilizing vignettes to emphasize perspective. As Francis took his plight to the police and the surrounding community and found himself on two sides of an insane asylum, the film posed powerful questions about subjectivity and reality. “Dr. Caligari” is often thought of as the first horror movie; it has greatly impacted American filmmaking by popularizing techniques such as the twist ending and an unreliable narrator. The performance began with a welcoming introduction by sophomore Hannah Baron, who then lead the ensemble and audience in a deep listening exercise. “Close your eyes,” she began, “and think about your childhood. The parts you enjoyed, and the parts you did not enjoy as much.” She instructed us to focus on the less enjoyable aspects of it and try to find some nightmares and monsters that might be found in there. She then prompted the audience to vocalize what that monster might sound like, whenever they felt inclined. The audience erupted into growls and hisses, yelps and screams, and it all swam together for several moments, rising and falling, clashing and balancing, until it disappeared into a low hum, a dissonant harmony flowing from the stage. As the film began, the ensemble took up their instruments and began to punctuate the hum with steady, progressive steps on the piano and bass. It was fascinating to hear the group create themes for the characters as the scenes were ongoing, and to hear the way they incorporated their abilities and personal sounds into the soundtrack necessary to the story. One of the vocalists let out a piercing scream at the film’s climax, and whenever bells were rung the percussionist clanged his cymbals. Each character’s appearance on the screen lead to a familiar theme that inspired distrust or assurance. The performance included an inspired use of vocal sampling, which was just quiet enough to create a sense of uneasiness. This made the audience unsure of who was speaking or where the sounds were coming from. The vocalists mostly stuck to haunting harmonies, only speaking words when they hissed the name of the somnambulist. The group, as usual, wowed the audience with their talents as individual musicians and as a body. The act of improvising with a group never fails to amaze and impress me. Be sure to catch IGLU’s next performance in February!